NUA St Georges Building, photography by Pete Huggins. 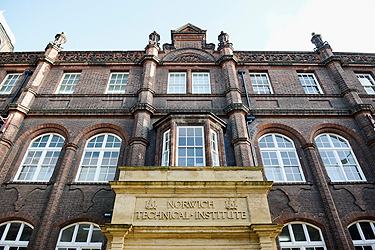 In addition to the Sainsbury Institute’s strong relationship with the University of East Anglia as our principle academic partner, one of the other members of the academic community in Norwich to which our Institute belongs is Norwich University of the Arts, or NUA. 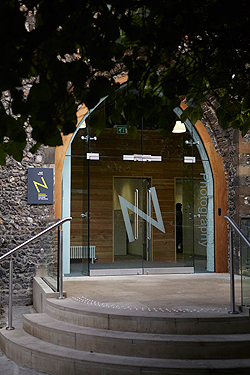 Just a stone’s throw from us and also in the historic centre of the city, NUA’s history goes back some 165 years to its original incarnation as Norwich School of Art. This year NUA celebrated its new full University status, and installation of actor John Hurt CBE as its first Chancellor, with a couple of other accolades; it has been voted top Specialist Art Institution in the UK by students within the 2013 National Student Survey and best Specialist Institution in Art and Design in the Complete University Guide 2014. In recent years NUA and the Sainsbury Institute have collaborated by bringing in Japanese specialists in traditional and contemporary art and holding joint exhibitions, demonstrations, lectures and events. The first of these partnerships involved a master textile dyer from Kyoto, Mr Yoshioka Sachio, giving a masterclass for NUA students and staff in October 2010. Famous for producing exquisite colours, vibrant yet understated, Mr Yoshioka has an expert knowledge of natural plants, dye ingredients and ancient techniques. In a two hour demonstration introducing natural dye materials, techniques and mastery, he encouraged students to see, smell and try for themselves the process of submersing the fabric in a cooled vat of simmered turmeric dye. The event was oversubscribed and the large room, normally reserved for silk-screening, was filled with eager note-pad scribbling and video-trigger happy students. Scenes of the workshop appear in the film Murasaki directed by Kawase Mika. Kawase was enthralled by Yoshioka’s staunch creative values and felt that his way of working confirmed her belief in remembering the subtle nuances of daily life. Having spent six months visiting his studio then trailing him for a year, Murasaki, or ‘purple’, celebrates Yoshioka Sachio’s oeuvre and has been screened worldwide including most recently at the Borneo Eco Film Festival (BEFF). 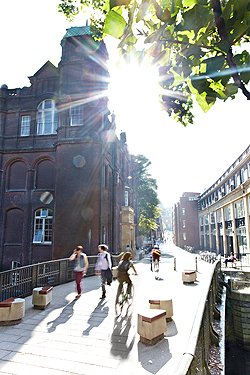 NUA Photography Building, photography by Jamie Garbutt. Riding on the success of the textile demonstration, in 2012 the two institutions hosted a six week long exhibition at NUA on the history of Japanese washi or handmade paper called Washi: the Art of Japanese Paper. An accompanying catalogue with the same title was produced by the curator of the exhibition and 2013 Sainsbury Fellow, Nancy Broadbent Casserley. Nancy, who now splits her time between the UK and US, sent us her thoughts and experiences on curating the successful exhibition in this issue’s ‘Letter from the Fellow’. This was a much larger project, with a programme of associated events, including lectures and a conference, which Nancy discusses further in the ‘Letter’. Many who came enjoyed not onlywashi making demonstrations, but also music and dance performances organized by Mrs Sakata Yoshie who heads awashi preservation group, 21st Century Washi: The Soul of Japan. Three nagauta musicians and a dancer performed a special ritual dance where washi paper plays an important role to an attentive audience experiencing the performance that took place in the foyer of NUA’s Duke Street building. Over 5,000 people visited the show to see the stunning display ofwashi examples from two major collections. The Parkes Collection consists of 400 or so different specimens of paper making up around 2,500 washi pieces, all assembled by Sir Harry Smith Parkes, the British Consul in Japan between 1869 and 1870, at the request of Prime Minster William Gladstone. The other group of materials was provided by the 21st Century Washi: The Soul of Japan committee. This comprises more than 1,000 washi samples stemming from a 10-year project to document the state of washiproduction in Japan at the turn of the second millennium. There were also a number of related paper-themed exhibitions hosted by local galleries and interest groups. NUA St Georges Building, photography by Owen Richards. As all good things come in threes, our third joint venture brought together Kuwashima Tsunaki, a contemporary photographer from Japan; Andi Sapey, Photography lecturer at NUA; and Kazuko Morohashi, Research, Planning and PR Officer at the Institute or better known as our ‘unofficial’ photographer. The two-hour after-work lecture held at the Institute was attended by keen photographers, artists and enthusiasts who learned about some of the techniques, methods and ways of expression used in contemporary photography. Kuwashima is an award winning photographer who worked on a series of images that harks back to the archaeological past of Japan. Using non-conventional platinum palladium prints and rare or discontinued high metallic prints, he projects Jomon period clay figurines in ghostly haunting style predominantly shown as monochromes. It was visually interesting to see Sapey’s photographs, which in contrast pay a greater importance to colour. The lecture was set out to be an informal evening and was successful in achieving its ambition as speakers gave candid remarks on how they carve out their careers. Kuwashima described how he accidentally stumbled into commercial photography by capturing powerful images of firefighters tackling a wildly blazing house in his neighbourhood. Sapey’s break came after winning a small photography award for his wistful depiction of poppies, but was not shy in revealing that before the award he was a restless soul having returned from a three-year around the world adventure to an exasperated savings account. The Institute hopes to build on the success of these joint projects with NUA to create programmes that emphasise the creative processes, technique and mastery seen in the art of Japan, as yet little known in the UK.